Six US planes linked by campaigners to "extraordinary rendition" used UK airports 73 times since 2001, Transport Secretary Alistair Darling has said. Campaigners claim to have details of planes used by the CIA to transfer terror suspects to countries where they could be tortured. Mr Darling confirmed the serial numbers of planes that had landed in the UK matched those on the campaigners' list. But he said he had no evidence they were involved in rendition. US Secretary of State Condoleezza Rice has denied the US uses torture, but insisted the practice of extraordinary rendition was not unlawful, adding: "Renditions take terrorists out of action, and save lives." The British government says it has told Washington it expects it to seek permission for any rendition flights taking detainees via UK territory and airspace. But Foreign Secretary Jack Straw told MPs earlier this year the government was only aware of two cases of the US requesting and being granted permission to transfer detainees via the UK, both in 1998. The National Air Traffic Service has previously said there were 200 flights through British airspace in the past five years by the CIA planes associated by campaigners with rendition. Liberal Democrat foreign affairs spokesman Michael Moore asked Mr Darling for details of landings by six jets with the registration numbers N2189M, N8183J, N970SJ, N129QS, N368CE and N85VM. In a written Parliamentary answer, Mr Darling confirmed the planes had landed respectively 10, 12, two, five, 20 and 24 times at UK airports since January 1 2001. But he added: "None of the information held by my department provides evidence that these flights were involved in rendition. "The British government is not aware of any cases of rendition through the UK since May 1997, apart from the two cases in 1998 about which the foreign secretary has informed Parliament." The flights revealed by Mr Darling included one stopover on the way between the Afghan capital Kabul and Washington and others stopping on their way to destinations in the Middle East such as Amman in Jordan and Riyadh in Saudi Arabia. Earlier this week, Mr Straw said claims the US has secretly flown terror suspects through the UK would eventually "fall away" due to lack of evidence. 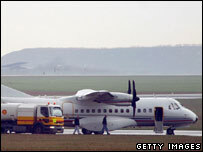 But Mr Moore said the disclosures raised "serious questions" about the number and purpose of CIA flights through the UK. "Coming after the Council of Europe found major holes in the oversight of foreign security agencies, this compounds the case for a review of air traffic controls and a full inquiry into international rendition," he said. "A fundamental question remains unanswered. Has the UK government actually asked the United States how many individuals have been rendered through Britain? If this hasn't been asked, then why on earth not? "Given the seriousness of the allegations, we have a right to expect both the British and American governments to come clean."